Sniper II | Welcome to A.P.E. The Sniper II includes enhanced programming and operational features. Programs may be created, edited and stored on board the system or managed with the optional GDW software from a Windows based PC environment. The system’s rework process is automatically controlled by the machine and switched off after it’s cycle. Sniper II Control Features and SMD-7000 Order Information Overview: The Sniper II includes enhanced programming and operational features. Programs may be created, edited and stored on board the system or managed from a optional Windows based PC environment. The system’s rework process is automatically controlled by the machine and switched off after it’s cycle. Sniper IIThe Sniper II includes a sixteen (16) profile, sixteen (16) segment controller, which is easily programmed using an integral key pad. Alternatively the system can be controlled via an RS232 connection with an optional external computer. The optional computer software operates in a Windows based PC environment. Profile Pattern Recipes (PPR) are easily created, stored, recalled, and edited using a “Graphical Display Window” (GDW). Programs are automatically up loaded to the Sniper II controller. Any number of PPR’s may be stored for future recall. It is not necessary to use the computer for general operation. To run a PPR, the operator simply selects the PPR from the Controller panel and presses the “Run” key. The program is then run automatically. 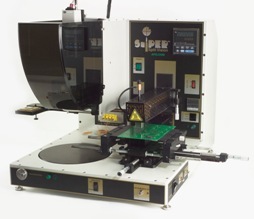 The operator need not be in attendance during the reflow process. The bottom heater is controlled by the top reflow controller. The top and bottom Heaters are automatically switched off after the rework program is complete. Once the rework operation is completed, the event may be automatically “Data Logged” using Adobe.pdf graphical images. These are easy to read and can be communicated via the internet. The optional APE Thermal Tracer tracks up to six (6) sensors, which can be strategically located at and around the component. The sensors are used to develop a “Profile Pattern Recipe,” indicating the actual board temperatures during the rework process. The system can also be used to calibrate the Sniper hot air delivery. The 8300-9660 is supplied as a PCMCIA Card for insertion in a Lap Top or within the Card Reader option.